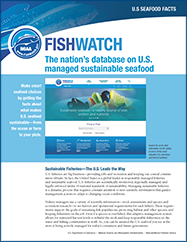 FishWatch provides regularly updated, easy-to-understand information on why choosing sustainable seafood is a smart decision. 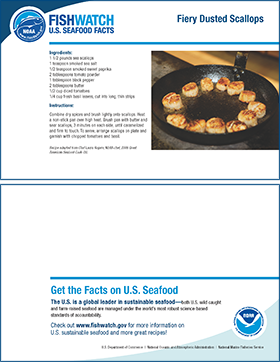 NOAA Fisheries developed this content to help spread the word about the science behind U.S. sustainable seafood. Use this video to introduce consumers to FishWatch, which provides easy-to-understand, science-based facts to help consumers make smart, sustainable seafood choices. 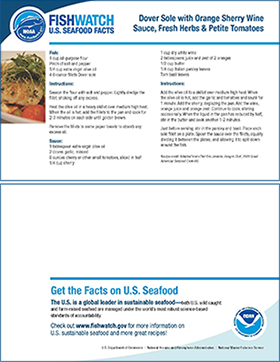 Use the fact sheet to tell others about FishWatch and how its easy-to-understand, science-based facts help consumers make smart, sustainable seafood choices. Get the Facts on U.S. Seafood. 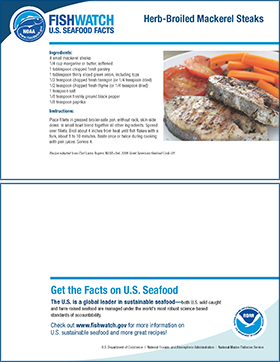 Use this postcard to tell people about FishWatch and how it provides up-to-date, science-based seafood facts. 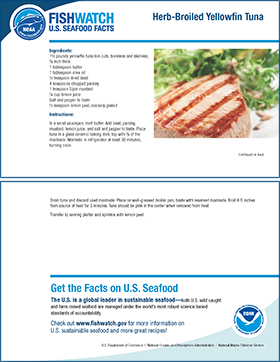 Learn what makes U.S. seafood sustainable—from the ocean or farm to your plate. Hand out these business cards for a quick and easy way to point people to FishWatch. Do you need recipe cards to hand out at your next event? Check out the list of recipes by region below. We can provide you with the art files for printing these handy giveaways for your next sustainable seafood event. 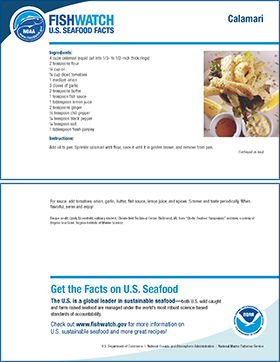 Please email fishwatch@noaa.gov with a list of the recipe cards you’re interested in. For more great recipes, check out our recipe index. 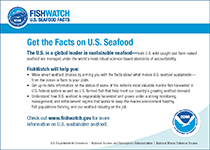 Add information on sustainable seafood to your website with the FishWatch web badge! 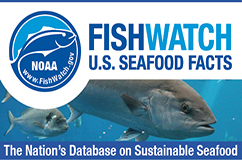 The FishWatch web badge is an eye-catching way to link directly to the FishWatch website. Once you have added the badge to your web page, there is no technical maintenance. NOAA Fisheries will update the content automatically. To use the web badge, simply copy the line of code below and paste it into your web page. You can adjust the width and height of the IFRAME to suit the design of your page. If you need help adding the badge to your web page, please contact your webmaster or service provider. 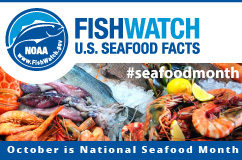 Use this badge to celebrate seafood month and inform consumers! NOAA Fisheries has developed a public API (Application Programming Interface) for use by web developers to utilize FishWatch data. Learn more about the FishWatch API.